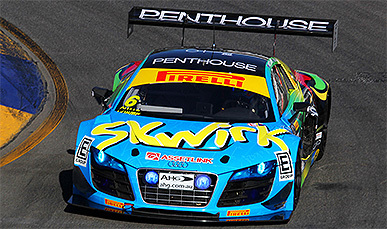 With the beautifully turned out Skwirk / Beechwood Homes Audi R8 LMS Ultra prepared by the Melbourne Performance Centre, I was ready to start the 2015 Australian GT Championship on a high. The car looked amazing with EGroup and Assetlink featuring on the car and Penthouse Australia joining us for the weekend spectacular on the streets of Adelaide. This was my first visit to the Clipsal 500 Adelaide street circuit. A track walk with my engineer Ric Kemp on Wednesday revealed what all the hype was about. I could see that the bumps and kerbs were going to make some very exciting driving but I was fully confident that the Bilstein Suspension could handle anything that was thrown at me. I was instantly in love with the track and its difficult nature. Practice one and two were purely used to familiarise myself with the track and fine tune the setup of the car. We opted for a slightly different setup to that of Audi factory driver Christopher Mies and my aim was to be super strong at the end of each race. This was going to make it hard for me in qualifying as the time was too short to get the car singing strong but I managed to put together a good enough lap to qualify 4th for race 1. We lined up early Saturday morning for the 30 minute sprint race. I felt great in the car and had a good start, holding position through the first few corners before making a move for 3rd position into turn 7 on the lap 1. I kept my eyes up and focused on driving some good clean laps and building my rhythm but it wasn’t long before the safety car was deployed due to an incident on the track. This opened an opportunity for everyone to dive into the pits for their compulsory pit stop and due to my driver time penalty I came out of the pits further down the field. After a clean safety car start I got my head down and started chasing down the leaders. I got myself to 2nd position with 2 laps to go and I got a great run through turn 8 to pass the Porsche of Marcus Marshall into the breaking zone of turn 9 and pulling a gap to cross over the line in 1st place! 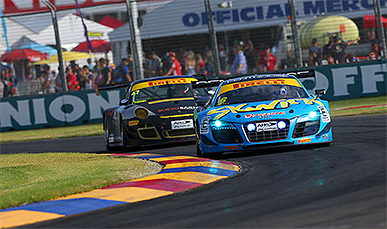 My first outright win in Australian GT. This was a one hour race where cars with two driver needed to do a compulsory driver change when the pit lane window was open. I started from pole position and had a great start holding my lead and immediately driving to pull the biggest gap possible before the hard charging Chris Mies got clear of traffic and started to catch me. I struggled to get the car working for me in the first half of the race and eventually lost the lead to Chris. I tucked in behind and worked with him to pass lapped traffic. Unfortunately we got caught in the confusion of lapping cars at turn 9 which caused Chris and I to have some unnecessary contact, but thankfully we were able to continue without damage. After my pit stop I was still in the lead but with a drive through penalty issued by the race stewards for the contact at turn 9, I dropped to 2nd position and re-emerged from the pits about 10 seconds from the lead with only a few laps to go. As confused and in shock as I was with the penalty, I took it on the chin and put my head down to catch my Audi team mate ahead of me. The car felt fantastic, the Bilstein Suspension setup was working perfectly. I set my fastest laps of the race and managed to take back the lead with a lap to go and took the chequered flag for my second win of the weekend! On Sunday morning, race three was another 30 minute sprint race. I had another clean start to hold my lead but Tony Quinn’s McLaren didn’t make it easy for me into the first corner. As we approached turn 4 I looked into the mirrors to see if Tony was going to make a passing move and I noticed there were no cars behind Tony. Within seconds I had confirmation over the radio that there had been a massive crash at turn 1 which had claimed at least 5 cars. Thankfully no one was hurt and the safety car was deployed for the second time in the weekend. All drivers once again used this opportunity to make their compulsory pit stop and once again I fell out of the top 10 due to my driver pit stop time penalty. When the safety car eventually pulled back into the pits the race was on and I had a lot of work to do in only a few laps left of the race. I managed to thread through the traffic quickly and get myself into 3rd position where I finished, claiming 150 points for the championship and securing my first Australian GT round win. My thanks to all my sponsors for their support, Foxtel for giving us all amazing TV coverage, Melbourne Performance Centre for being such an amazing team, Rod Salmon for his support and trust, and the incredible Ric Kemp for doing a brilliant job on the car as well as keeping it all on the track to success! Follow me on Twitter for news and updates to my blog and Facebook.